What is a good eyebrow embroidery? If you are not satisfied with your current eyebrows and wanted to improve it, below are important points to help you gauge what is a good eyebrow embroidery service. Able to create brow shape that suits your face and the shape. A good pair of eyebrows makes you looks more energetic as it enhance and highlight your face. No one in this world actually born with absolute even eyebrow and brow bone of both sides. Therefore, our eyebrow embroidery artist does not recommend to use ruler or mould to design the eyebrow shape as the outcome will be stiff looking and unnatural. Engage an experienced artist instead is extremely important. She knows how to design your eyebrow in such a way that it blend with your facial features including your brow bone to give a balance and natural look. So the ultimate outcome should be: Hardly someone will notice that the microbladed eyebrows you are having now is “fake”. Professional eyebrow artist are able to give you constructive advice on what suits you better instead of leaving the decision to you. We have seen many customers turn to us saying that they regretted to choose certain eyebrow service so when we deep dive into it, we discovered one of the reason why it turn out pretty bad is because that they choose the shape they think suits them. So, leave it to the expert! Check out on our portfolio for hundreds of successful eyebrow embroidery we did for our customers. Hair line stroke resemble real eyebrow hair that you cannot tell that the eyebrow has been embroidered. Detail such as matching colour with your existing brow hair also counts. The best eyebrow embroidery stays semi permanently. 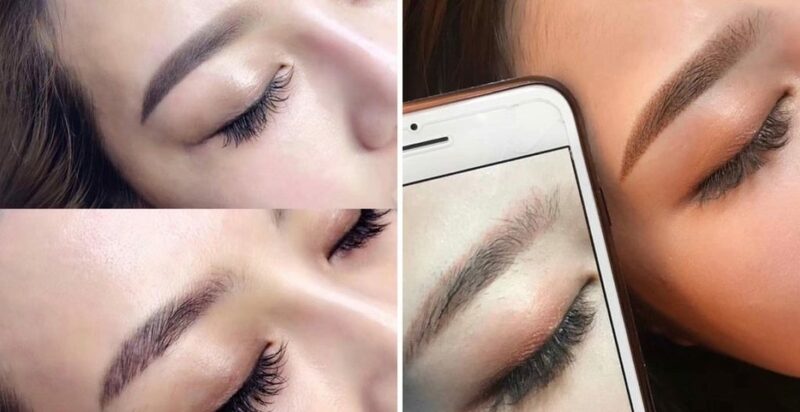 The eyebrow embroidery can last one year to one and a half years. This is depending on the eyebrow artist’s skill. If the colour pigments are being cut into too deep to skin epidermis, not only your newly done eyebrows will looks very dark in colour, but it will also left you with unfavourable grey, greenish and blueish marks on your eyebrows after 1-2 years. Use only Organic pigment. Your skin around eyebrow are delicate and soft so we only use non toxic colouring on it. Feel safe when engage Browart Studio for the work as we take care of our customers from many aspects.